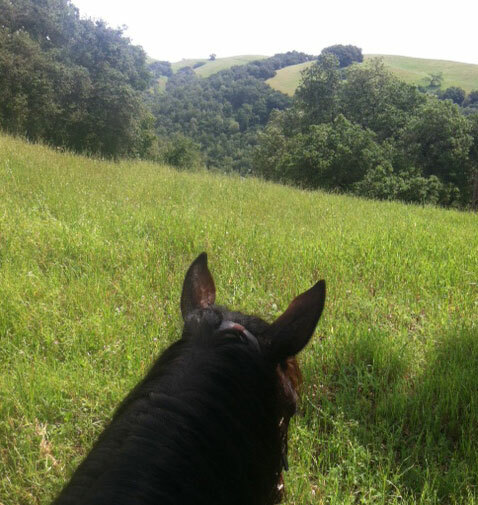 Camping with horses provides a new perspective after years on the horse show circuit. My gelding, Corazon, spent the majority of yesterday morning tied to the fence, which for reasons I’ll explain more in a moment has become his daily routine. One hind leg cocked in a resting position, he stands dozing in the sun while the barn’s activities unfold around him. Except for some interest in commotion around the grain room, he stands slack-lipped and content. There is a point to all this standing around. He does not know it yet, but his near future includes a couple of overnights of being tethered to a fence, a tree branch, a tie post. In the last several days as the bright orange poppies have erupted from the rich spring soil here in California, I’ve had horse camping on the brain. Acacia blooms have filled the air with syrupy sweet smells, frogs croak from streams throughout the early evenings, pollen floats across water troughs. In no time it will be full-on summer, and this has me excited about horse camping, which has become quite unexpectedly one of the great pleasures of the season for this stiff-lipped Dressage Queen. Until a few years ago, I kept my camping adventures and my horse activities separate. Born and raised on the northeast horse show circuit, where the concept of overnighting with horses included barns and hotels, I imagined sleeping on the ground next to one’s horse as something that only happened in Western movies. When I got involved with Ride and Tie racing about six years ago, I got a simultaneous introduction to camping out with horses due to the remote location of these events. The first time we arrived at a race, I looked around a giant meadow with dozens of horses tied to trailers and realized that they were going to stand there all night. There was no barn, no hotel rooms for us humans. We would not be mounding fresh shavings around our horse’s legs and then driving to a restaurant for dinner. Instead, a few short hours later, I was eating a sandwich from my lap under a sepia sky as our horse swished his tail at flies. I sipped wine from a plastic cup, leaned back in my canvas chair, and absorbed the fact that we were not at all part of a Western movie. Later, I rolled out my sleeping bag on the lumpy ground next to our steed with a restless anxiety that he might disappear by morning. What if he got bored, impatient, spooked? Would he break his rope and run off? And, if he did, what the heck would I do in my pajamas in the pitch dark in the middle of nowhere? I slept only a few winks here and there and then woke up for good before sunrise with a stiff spine. Our horse still stood tied to the trailer looking rather at ease. I watched his silhouette through the darkness, listened to his breathing against the backdrop of camp sounds: enamel pots being readied for coffee, a horse behind us pulling hay from his net, the dry rustle of someone walking through the field towards the porta-potty. Something inside me loosened. Maybe it was the clench of worry, the acceptance that this whole scene—dozens of horses standing tied to trailers or trees all night—was actually quite natural. Horsemen and horsewomen had been camping this way for a long, long time, I reminded myself. Right then I began to fall in love with it. 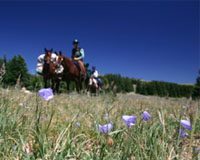 Despite its lack of hotel room comforts, horse camping at our Ride and Tie races has become one of the anticipated treats of each summer. I have come to love the fresh scent of wild sage in the cool mornings before a hot day on the trail, yipping coyotes in the middle of the night that sound close enough to touch. 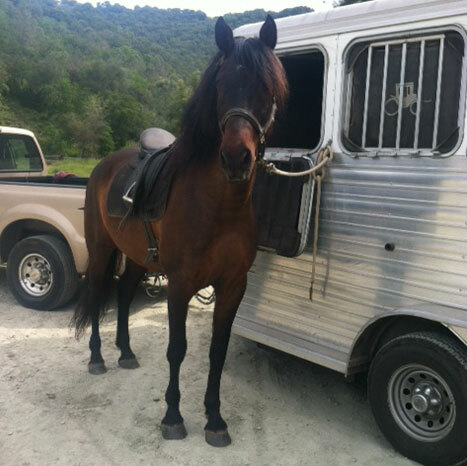 I’ve learned to savor waking before sun-up to walk our horse around camp and stretch his legs while the dog trots beside us silently, have become entranced reading by headlamps at night while listening to horses outside our tent slurping water from buckets or readjusting their positions at the trailer. I have sunk down in our camp chairs pleasantly tired at the end of a long day and watched a hawk looping across the clear blue sky, while a cluster of fellow riders huddled under the shade of an oak tree, and camp filled up with the smells of barbecue. These times have held an old world magic that I can’t quite put my finger on. But I know Corazon, with his adventurous spirit, will enjoy it. This summer, if all goes well, we’re planning to ride and camp a segment of the Pacific Crest Trail. To me, this feels about as natural, and at the same time highly skilled, that horsemanship can be. Jec Aristotle Ballou is the author of 101 Dressage Exercises for Horse & Rider. Jec A. Ballou is the author of 55 Corrective Exercises for Horses: Resolving Postural Problems, Improving Movement Patterns, and Preventing Injury.